Situated near Chippenham just 12 miles from Bath in the Cotswolds sits Castle Combe, a beautiful English picture-postcard village that straddles “By Brook”, the small stream that runs at the edge of the village which has been much photographed throughout the years. 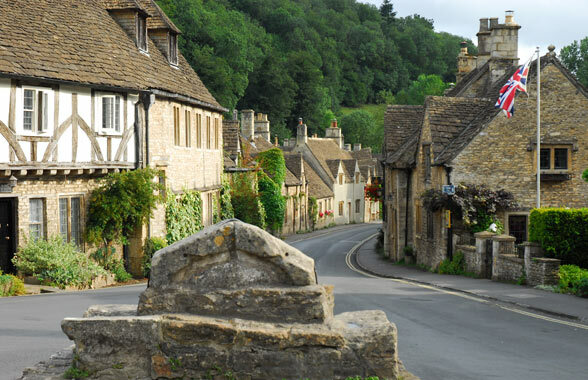 Known as “the prettiest village in England”, Castle Combe is a big attraction but despite the number of visitors each year, the village itself seems to remain as it has always been, offering peace and tranquility and an insight into days gone by. There are no shops to speak of but hand-made cakes are for sale on a pretty table along the pavement and a few of the houses open their stable doors to sell refreshments and food to walkers and visitors as they pass by. Quilting courses are also on offer in the village, again a reminder of how village life used to be. Despite the name, there is no longer a castle but it began as a Roman Fort and was later developed into a castle by the Normans. It eventually fell into disrepair during the 14th century with only the earthworks now remaining. Using the water supply from ‘By Brook’, the village developed as an important centre for the wool industry in the 16th century and fifty new cottages were built to house the weavers, however the latter end of the 17th century saw a decline in the water levels and the weavers were forced to go elsewhere. The village as it is now consists of the rows of weaver’s cottages, The Manor House Hotel whose gardens lead past the medieval church, The Castle Inn and The White Hart, plus a number of holiday lets and B&B’s. Situated in Castle Combe, the Manor House Golf Club is set in 365 acres of rolling countryside and was designed by Peter Alliss and his designing partner Clive Clarke in 1992. It is now widely regarded as one of the finest golf courses in Wiltshire. The Castle Combe race track is located approximately ½ mile from the village and was opened in 1950, just 18 months after the opening of Silverstone. Despite noise disputes from local residents over the years, the track is now well-established and functions as a national racing venue for car and motorbike races and events. Castle Combe and the surrounding areas offer the walker a paradise of scenery and beautiful landscapes. Paths are clearly marked and take you across country, through villages, along wooded tracks and past lovely stone cottages and hamlets as you pass by. We walked the lovely 6 mile looping walk around the village to Ford and back again, details of which can be found on the AA website. The route was steady aside from one very steep hill and offered varied scenery, woodland, fields, streams, hamlets and wildlife along the way. A great all-round walk that we highly recommend plus ‘The White Hart’ at Ford looked very tempting indeed but we had a mission to achieve! By Car – the nearest junctions from the M4 motorway are Jct 17 (Chippenham) and Jct 18 (Bath). Once you leave the motorway, follow the signs to Castle Combe. The village is a little unusual as visitors park in the car park at the top of the hill. There is a bit of a steep walk back up again so take note! This allows the village to be almost free from parked cars and enhances the photo opportunities in between the sightseers travelling through on the road.